So do you want to Update Redmi 4 to Miui 9 Officially ? and want to Install MIUI 9 in Redmi 4 ? Alright, so you have recently bought the latest lower budget Smartphone from Xiaomi, the Xiaomi Redmi 4. Do you want to Update it to the Latest MIUI 9? Well, it should have come with MIUI 8 out of the Box. So How to Update it to MIUI 9, you might ask. Well, you need not worry, Root Update got your Back. In this post, we will tell you about How to Update Redmi 4 to MIUI 9. 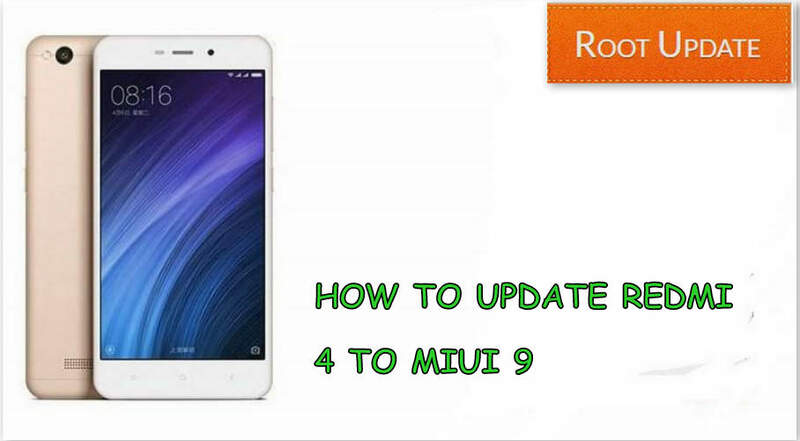 But wait, before getting straight to our Guide on How to Update Redmi 4 to MIUI 9, let we know What is MIUI 9, and its features. Well, MIUI, in case you don’t already know is a Custom Skin of Android by Xiaomi. The MIUI 8 is based on Android 6.0 Marshmallow, and the Latest MIUI 9 is based on Android 7.0 Nougat which is latest from Google. MIUI 9 brings a lot of features in the Redmi 4 like Doze Mode, Better Ram Management, More battery. With MIUI 9, you get a better User Interface, Ram Management is also improved which is good for you if you are sort of heavy user who likes to play heavy games on Smartphones or someone who likes Multitasking. Battery backup which was already phenomenal on Redmi 4 is now even better with MIUI 9. MIUI 9 also adds a Feature which is called Doze mode which helps to optimizes the whole smartphone and thus makes multitasking easy. So Now, let us start our Guide on How to Update Redmi 4 to MIUI 9. In order to Update Redmi 4 to MIUI 9, you need some requirements, let us see what are those. You need your Redmi 4 of course in order to Update your Smartphone to MIUI 9. Make Sure that the Redmi 4 you have is running on the MIUI 8 currently, if you have installed any other Custom ROM, then this will not work. You will Require Root for this Guide. Your Redmi 4 should have at least 60% Battery. Make sure you have enough Storage Space available. Once you have all the Requirements Fulfilled, your are ready to Update your Redmi 4 to MIUI 9. To Update Redmi 4 to MIUI 9, follow each of the following steps carefully. Once you have downloaded the above file, go to your File Manager and Move the file from Downloads to Downloaded Rom Folder. Now go to the Updater App on your Redmi 4. Select “Check for System Updates”. You should now see MIUI 9 downloading, it means you are lucky enough, you need not do anything it will automatically be updated to MIUI 9. In case you haven’t got the Update, don’t worry follow these steps. Go to the Updater App, now you should See an option to Install System Update. You will be asked to choose package. Chose the file you downloaded and placed in Downloaded Rom Folder. Now Select “Reboot and Install”. Done! You have successfully updated your Redmi 4 to MIUI 9. That’s it, Guys, that was our guide on How to Update Redmi 4 to MIUI 9. In case you have any queries you can leave them in the Comments below. Is this rom for the Redmi 4x (santoni, India version) or for the Redmi 4 (prada, China version)? Error Coming . verify failed it is not allowed to flash rom between different android version.